If you stop to think about it, the purpose of worrying is to prevent something bad from happening, whether it be a plane falling out of the sky, a car careening out of control, or something more mundane, like fumbling for words in front of your superiors at work. You can take precautions, like wearing a seat belt or practicing in advance; however, after a certain point, the situation is out of your hands. Reminding yourself of this simple fact can actually help you to stop worrying about the situation. This basic premise is acknowledged in the first line of the Serenity Prayer. Conversely, if something is within your control, make sure you prepare accordingly. Although generalized worrying can be unhealthy for you, focusing on what can go wrong and what you can do to prevent it or lessen the impact can actually be beneficial. This is known as having a solution-focused attitude, and it means concentrating on what you can do, rather than worrying about the potential fallout. Worrying about the possibility of technology failing (the projector won’t work or the Internet is out, for example) during your big workplace presentation is unhealthy generalized worrying. At the same time, assuming that technology will fail and preparing a backup (hard copies of your presentation or a short spiel explaining that video that won’t work) is an example of solution-focused thinking. Often, I find myself worrying about things that are out of my control but are in control of another person. A good example of this is flying — what if the pilot makes an error? Another example is when my husband has a big opportunity at work, and I worry about whether he’ll succeed. Both of these are illustrations of the unhealthy, generalized worrying discussed above, but they’re also examples of trust issues. Other people are competent. They are trained, educated, and are vested in the success of what they’re doing. Recognizing this can go a long way toward alleviating your concerns and improving your relationships with others as well. Sorry to beat a dead horse, but to return to the example of worrying about plane flights — did you know the odds of an average American being killed in a plane crash in any given year is about one in 11 million? Even if you calculate the odds differently (and there are a number of different, yet equally accurate, ways to calculate your chances of being involved in a crash), the bottom line is clear — flying is generally a less-risky mode of transportation. Just knowing the odds of something occurring can help you to worry less. It can also help you know if there are any precautions you can take (see #2 above). For example, knowing that 49% of car crashes occur at night could motivate you to limit long road trips to daytime hours. If you don’t want to give up driving at night altogether, maybe the knowledge that two-thirds of nighttime car crash fatalities involve people who weren’t wearing seatbelts will convince you to buckle up, a preventative measure within your control. Ever heard of the fight-or-flight response? It’s a physical reaction people experience when they feel threatened that causes, among other things, a rapid increase in heart rate and breathing. It can also be a response to worry. One result of the sudden increase in heart rate is that the brain is deprived of oxygen, and you experience a decreased ability to think clearly. Combat irrational worrying by practicing breathing exercises that can help slow your heart rate and restore your capacity for clear thinking. Try to clear your mind of everything and focus only on your breathing, taking in slow, deep, and regular breaths and exhaling completely. When you worry too much, you condition your brain to expect terrifying results that are normally disproportionate with reality. You can recondition yourself to worry less by facing your fears, a tactic known to professionals as exposure therapy. Sure, it’s uncomfortable, but over time, you realize that bad things don’t generally come to pass because you failed to spend enough time worrying about them. For anyone out there who is a jumpy backseat driver (you know who you are! ), that means practicing sitting still while in a car over and over again — no gasping when the driver gets too close to the car in front of you, no clutching the door handles for support, and no offering words of “advice”! This technique was inspired by the Getting Things Done time-management system, which urges its users to capture every stray idea by recording it somewhere, so you can then forget about it altogether. The same tactic can be applied to worrying. Keep a “worry journal” to record the things that worry you. The act of writing your worries down can help soothe your fears. It can also help you pinpoint exactly what triggers your worrying and possibly help you identify solutions (back to the solution-focused attitude again!). This might sound counter-intuitive, but if you only give yourself a limited amount of time to worry about something, you are acknowledging that something bad could happen, but you aren’t letting it consume you. Try setting a timer for, say, ten minutes to think only about what’s worrying you. Try to think only about that topic during that time. 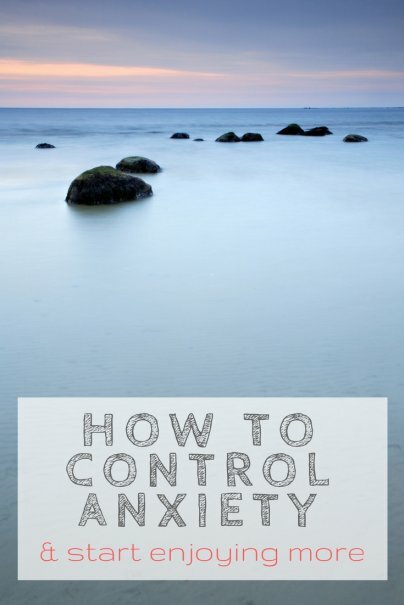 Once it’s over, conversely, consistently remind yourself that you can think about that issue only during your designated “worrying time.” According to MSNBC (via Lifehacker), a study using stimulus control therapy found that patients learned to associate a certain time and place with worrying, a result that strengthens the theory that you can condition yourself to save your worrying for later. Studies show that physically fit, well-rested people are less prone to anxiety. It makes sense — the more run down you are and the less you value yourself, the more you feel badly about things. This just gives you yet another reason to get out and exercise or (dog people, unite!) get a dog. According to several studies (via a New York Times blog), owning a dog motivates people to exercise more — about 30 minutes more per week on average. Don’t forget to get in a healthy amount of sleep each night, too. According to the National Sleep Foundation, adults need between seven and nine hours of sleep per night for peak mental health. Of course, there’s no shame in seeking professional help if you feel like your excessive worrying is out of control. Professionals provide neutral, third-party advice that can help you view a situation in a light you hadn’t considered previously or, if your worrying is the result of a chemical imbalance, they can prescribe medication. Unsure of what type of professional help you’re seeking? Check out this WebMD article on how to find a therapist, which clearly explains the many different professional labels in the field. What makes you worry, and do you think you worry too much? Share your thoughts in the comments! 49% of fatal crashes occur at night. That means that 51% of fatal crashes occur during the day. Why, then, do both this article and the Forbes article the stat is pulled from use the 49% to say that it is safer to drive during the day? A good observation, except what I didn't make clear (but Forbes does) is that many more people travel during the day and more miles are driven total during the day. Although 51% of fatal crashes happen during the day, the fatality rate per mile is about three times higher at night. Good catch! I'm a bit of a worrier, although not as much as my mom. One thing that worries me all the time is displeasing someone. I'm a people pleaser and I get worried when I feel that someone doesn't like me. I do all the things you mentioned in the first paragraph. Especially with flying. I always have to have a glass of wine (or two!) before getting on a plane. None of these things are new to me but are good reminders. It's also nice to know that I am not the only one who struggles with anxiety sometimes. I know all the self talk and agreeing with reasoning myself in certain situations, but the physical symptoms is uncontrollable (hands tremor, inability to concentrate, forgetfulness...etc.) despite the understanding, it's SO frustrating and energy depleting. What to do with it? It can be a deal breaker on the job interview. The advice to get enough sleep is excellent. I know I'm much more in control when I am well rested. It totally changes my ability to handle the days events.